Alleghany County is a hidden jewel in the northwestern part of the state. Many decide upon areas like Sparta and Roaring Gap as their ideal location for owning mountain property in North Carolina. Recreational parks like the New River State Park and Stone Mountain State Park dot the county and offer plenty of great outdoor activities that most like to enjoy while vacationing here. Getting out and about and starting to enjoy all that the Blue Ridge Mountains offer will provide tons of rare opportunities to see the native wildlife like deer, bears, and smaller forest animals. There really is nothing like getting out and enjoying the outdoors in Alleghany County. Below we have listed some of the best loved activities in Alleghany County. If you plan to buy real estate here, then get ready to have access to all of this and more. 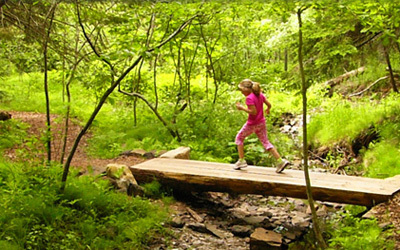 The Blue Ridge Parkway passes through Alleghany County and there are a few short hiking trails near the popular recreation area at Cumberland Knob and Doughton Park. Much of the property for sale here remains rural, so if you buy a few acres of land in Alleghany you can probably bet that you will have hiking opportunities on your property. In addition, there are hiking trails at Stone Mountain State Park, part of which is located in the county. These lead around the enormous stone rock that rises from the plateau in a peculiar way. The curvy roads of Alleghany County are great for cycling. Many people like to use the Blue Ridge Parkway as well, as there are numerous overlooks and places to rest and get water and the sights and sounds you will see are out of this world. There are plenty of rock climbing spots to be found at Stone Mountain State Park, which is a massive recreation area that surrounds a 600-foot dome of a rock. All of the areas where climbing is permitted are marked and designated; climbing is not allowed everywhere. All climbers are required to register and complete a permit application which is available at the base of the cliff. There are tons of secluded country roads and farmlands to horseback ride on in Alleghany County, and there are numerous equine enthusiasts in the area. One trail at Stone Mountain State Park, the Bridle Trail, is also a 5-mile horseback riding trail located in parts throughout the county. The ancient and majestic waters of the New River, which flows right along the western and northern borders of the county, have some amazing trout fishing opportunities throughout the area. New River State Park is a great place to start, but you must have a valid NC Fishing License. The Blue Ridge Parkway in Alleghany also offers some fishing spots and the Little River, which flows through downtown Sparta, is a nice mountain creek to fish. The New River is an extremely calm and slow-flowing river, creating many areas to tube, float and lazily canoe on nice sunny days. There are a few guide companies in the region that offer float trips on the New River, but it is pretty safe for individuals that just want to hit the river for a little while. Are you interested in buying mountain property in the beautiful Blue Ridge Mountains of Western North Carolina? Then think about buying property or real estate in Alleghany County. These lands are well kept and very much preserved so if you want to get away from it all, then buying mountain property in Alleghany County might be your top choice. Check out my listings of Appalachian Real Estate. Contact me today for all of your Appalachian Real Estate needs.